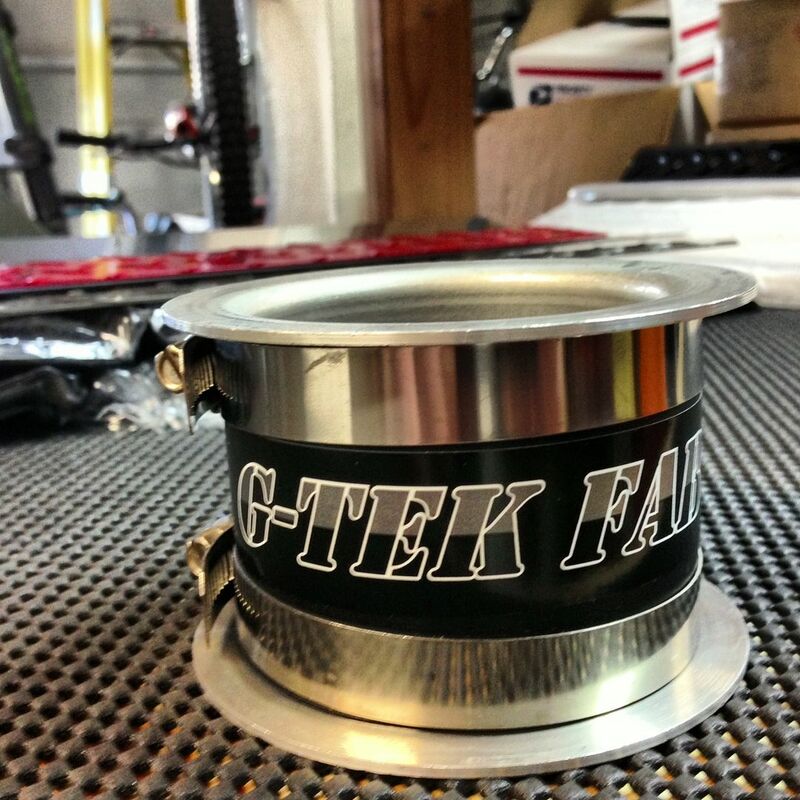 Thread: G-Tek Fab SABM (Stock Air Box Mod) "Air Boost" Kit Now Available! 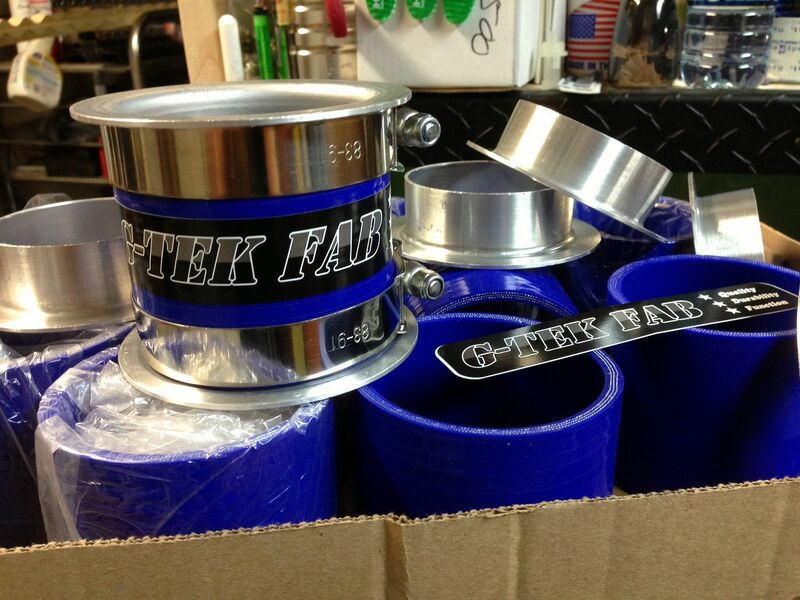 Re: G-Tek Fab SABM (Stock Air Box Mod) "Air Boost" Kit Now Available! Good to go ships Monday! The 2007/2018 Tundra and 3.5L 3rd gen Tacoma Kits have been moving fast lately. As of now my aluminum flange fabricator is swamped so there’s a 10 day wait for these parts. Very frustrating. Kits will be available again within two weeks. Yes they are, shoot me a pm if you’re interested. Bump! These kits are still moving fast, anyone interested can contact me through private message or if you’re viewing this as an unregistered guest you can use the “contact us” link at the bottom of any page. G Tek Fab products can also be purchased at www.TRDShop.com or you can look up vendor TRDJoe here on Tundra Geeks. G-Tek Fab SABM (Stock Air Box Mod) Kit is NOW AVAILABLE! Better gas mileage plus added performance at a fraction of the cost of an aftermarket CAI! Works great if you've lifted your truck and added bigger tires. This kit is designed for the 2007/2015+ Tundra 4.7 and 5.7 non supercharged & supercharged stock and TRD intakes! DON'T FALL FOR CHEAP KNOCKOFFS! Not sure what the SABM? It's a Stock Air Box Modification Kit that was developed back in 2007 when I first had my truck lifted. I loved the power when I first drove it but after lifting it and adding 37" tires it lost its punch. I searched for a way to add a little power so the first thing I looked at was a possible modification to the stock intake. After the modification the first thing I noticed was added performance, then I realized I was getting better gas mileage! This modification allows the motor to run more efficient at the same time allowing it to gulp more air when you step on it. More bang than an aftermarket cold air intake at one third the price for sure! There have been so many positive results by members after doing this mod I decided to put together a kit. Some great results are coming from the super charger guys! 8 to 10 HP gains! * Two 3" 6063 aluminum flange pieces one with a foam gasket attached. 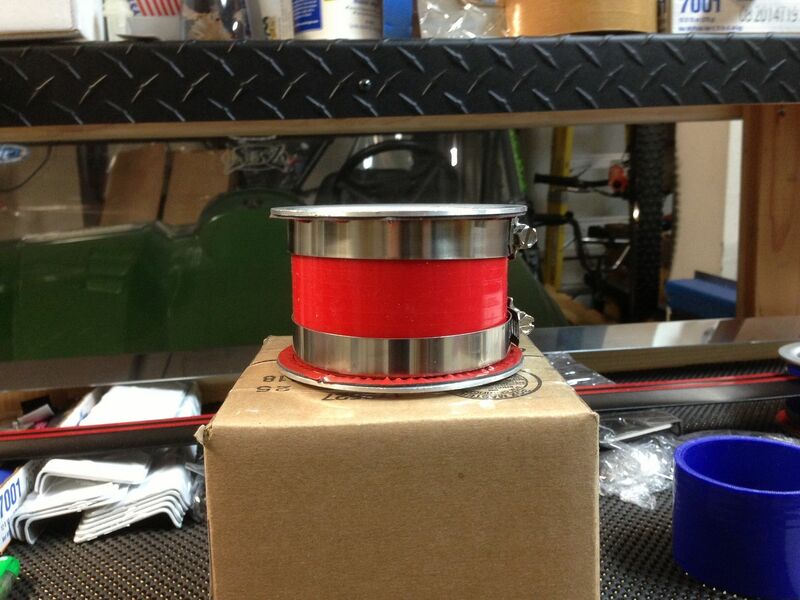 * Two 4"x3" aluminum flange rings one with a foam gasket attached. 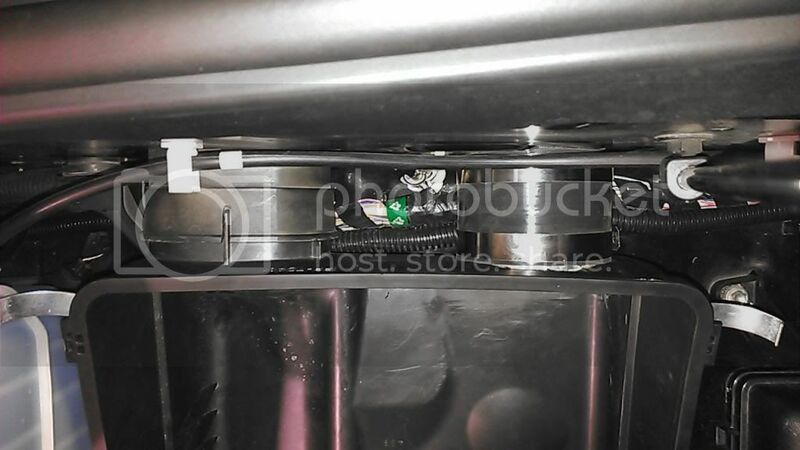 * One 5" length of foam seal for the outside of the air box base. * One 7" length of foam seal for the inside of the air box base. 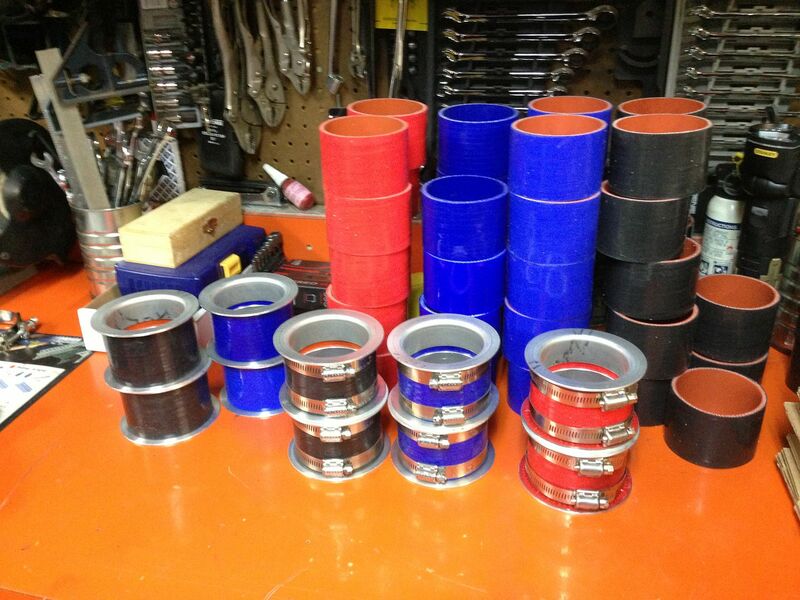 * One 4 ply silicone intake tube in black, red, or blue. * Two stainless steel 3-1/2" hose clamps. * Complete set of illustrated step by step instructions performed by a Toyota Tech on his own Tundra. 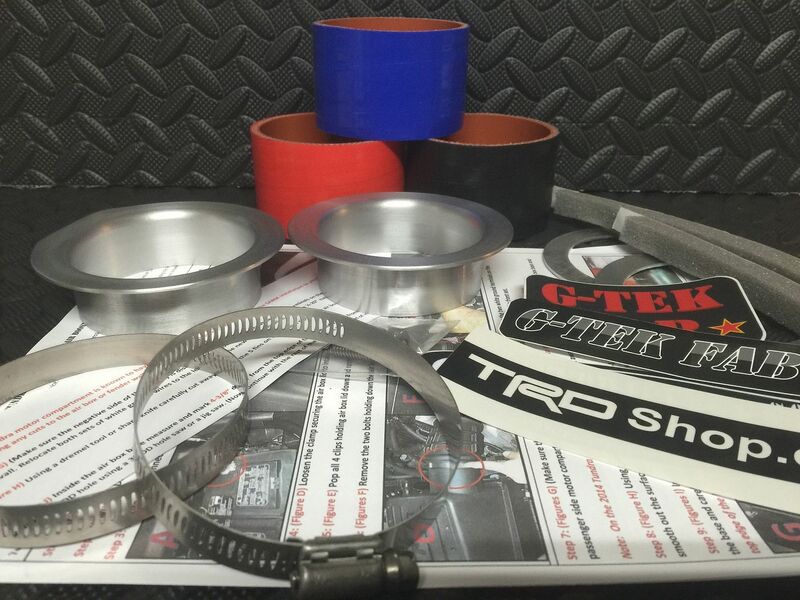 * G-TEK Fab, TRDShop.com and Tundra Geeks sticker pack. If you're viewing from the outside and you don't feel like registering just order or request info through our "contact us" link at the bottom of every page.